Polycystic Kidney Disease is (PKD) is an inherited disorder in which clusters of cysts develop primarily within your kidneys, causing your kidneys to enlarge and lose function over time. Cysts are noncancerous round sacs containing fluid. The cysts vary in size, and they can grow very large. 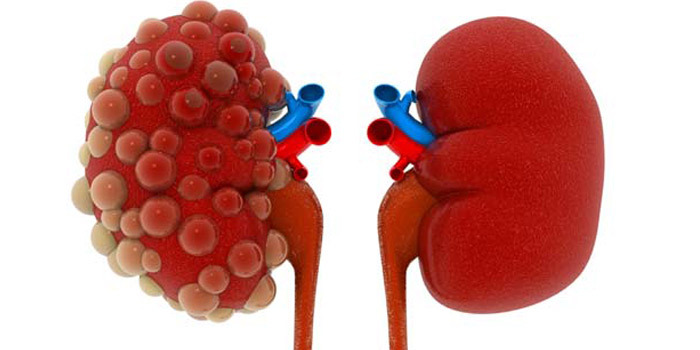 Having many cysts or large cysts can damage your kidneys. Symptoms include high blood pressure, back or side pain, headache, a feeling of fullness in your abdomen, blood in your urine, kidney stones, kidney failure, urinary tract or kidney infections, and increased size of your abdomen due to enlarged kidneys. Treatments include medications such as pain medication, blood pressure medication, antibiotics to treat urinary tract infections, a low-sodium diet, diuretics to help remove excess fluid from the body, and surgery to drain cysts and help relieve discomfort.